Topics: Bed & Breakfast, Guestbook, and Extras. It is hosted by Bluehost Inc (Utah, Provo,) using Apache web server. It has 2 DNS records, ns2.hostmonster.com, and ns1.hostmonster.com. 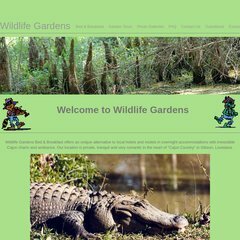 Wildlifegardens.com's server IP number is 66.147.240.161.